Join us June 29-30 for the 4th annual DCP Bike Challenge. This year’s route will feature scenic backroads of central Illinois starting in Peoria, Illinois and ending in downtown Terre Haute, Indiana. This all started in 2016 when a local businessman and his daughter decided to take a bike ride from Peoria to Green Bay, WI. The aim was to grow closer to each other as father and daughter. Not only did that happen in a big way but they also challenged themselves to raise money for a not for profit organization that was near and dear to their hearts. Brett and Katie Beachler raised over $1200 for Dream Center Peoria. This year they have chosen to ride from Peoria, Illinois to Terre Haute, Indiana. This memorable two-day ride is great for a first time family ride or for the serious rider looking for a fully supported ride. Proceeds benefit Dream Center Peoria and support it's mission to impact families living in poverty, starting with kids and youth. Cost: $250 per rider is required to register. All proceeds benefit Dream Center Peoria and riders are encouraged to set an additional fundraising goal to impact kids and families living in poverty. Ride distance is approximately 90 miles per day. Maps can be downloaded to your phone with the Ride With GPS app. Lodging for the one night, all meals, and rest stops are provided. Luggage transportation provided in separate vehicles for riders. SAG support, refreshment stops, and t-shirt are included. Use your road, touring, or hybrid bike or choose from a limited number of rental bikes Bushwhacker is offering our cause-free of charge. Contact brian.uhlenhopp@dreamcenterpeoria.org for details. 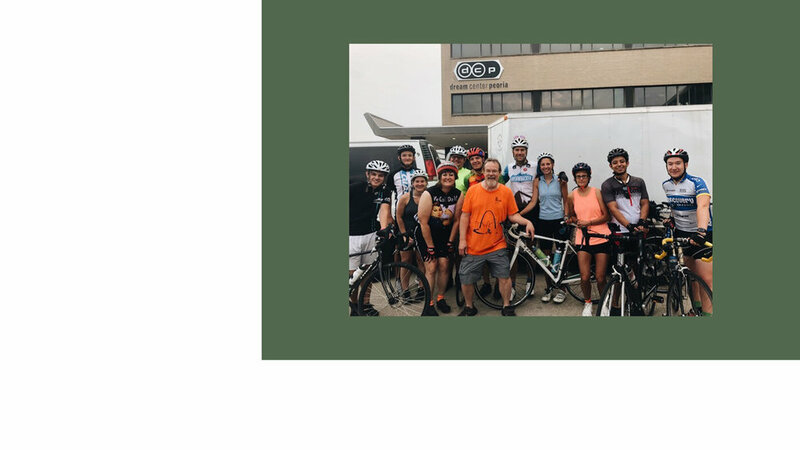 The DCP Bike Challenge is the only two-day ride out of Peoria, IL which specifically raises money to support families and youth living in poverty. Proceeds benefit Dream Center Peoria, a Peoria nonprofit with the mission of impacting families living in poverty, starting with youth. All participants pay $250 to register. Participants are then encouraged to set a goal and fundraise on top of the registration fee to better support the costs of the ride and help propel Dream Center Peoria mission to introduce hope to the homeless families and youth in Peoria. All registered riders will have the opportunity to create a personal online fundraising page to use in the months leading up to the tour. We will provide helpful tips on how to reach out to friends and family for their support as you prepare to pedal 180 miles in two days. Top individual fundraisers will be recognized and have the chance to win great prizes and tour perks. The fundraising program is optional but will be strongly encouraged. Riders can also make a donation in lieu of fundraising here. More information and instructions will be provided once registration is received. Contact brian.uhlenhopp@dreamcenterpeoria.org with any questions. If needed, riders may transfer their registration to another rider at any time, for any reason, at no cost. However, after May 30, we cannot guarantee the correct t-shirt size for the substitute rider. Until May 25, a cancellation refund will be issued for any reason, minus a $30 fee and any nonrefundable credit card fees. However, after May 25, no refund will be issued unless a rider on the waiting list – or someone else you know – can fill your spot. Sorry, but to protect us from both unused expenses and lost income, we cannot offer exceptions for any reason, including medical or other emergencies.